So this is one of the books that Silvery Dude was trying to persuade me to read because he had read and enjoyed it, and it certainly sounded interesting and became a must read (a) when the Book God mentioned he had a book of short stories by the same author which he regarded highly and (b) it became necessary to quieten Silvery Dude down. And it really did turn out to be a smashing little story, and I don’t use those adjectives as a means of putting this book down, because it is just lovely with charming characters and a simple but effective plot structure, and the story moves forward at a solid pace and it was a really positive experience to read. And I really should learn to breathe grammatically. But never mind, I’m sure you catch my drift. 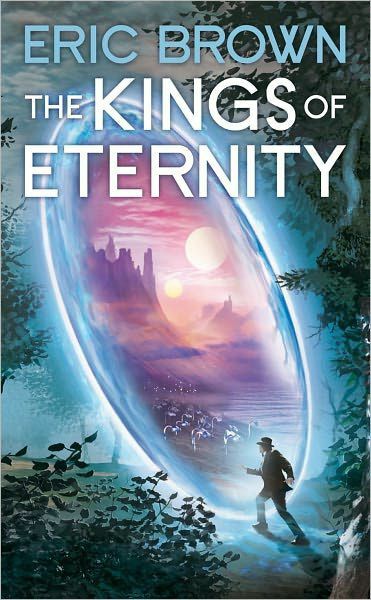 The Kings of Eternity takes place across two time periods – 1935 when Jonathan Langham and Edward Vaughan go to the country to help their friend deal with what turns out to be an incursion from another world (really not giving anything away here, its in the blurb and the front cover artwork kind of gives it away), and 1999 when we find Daniel Langham, a famous author living a life of seclusion on a Greek island , where the secrets of the past threaten to catch him up. So on the one hand we have a marvelous HG Wells type story and on other we have what turns out to be rather a sweet love story, and of course the two will merge and we will understand what’s been going on all along. Actually, anyone who has read a lot of sci-fi will work out quite early on what’s going on and I certainly found it quite easy to work out how this was all going to end. But that doesn’t matter. Because the HG Wells bits are fabulous, the love story is really sweet and all the characters that you are supposed to be rooting for are really nice. I certainly did so, and can recommend it.